View looking west southwest at the Strait of Mycale. On the left (east) side of the image is Mount Mycale which is in Turkey. On the right (west) is the Greek Island of Samos. The open water between them is the "Strait of Mycale"—only 1 mi. [1.6 km] wide! The route that Paul's vessel took from Chios to Miletus is carefully examined by Dr. Mark Wilson at the beginning of his article "The Ephesian elders come to Miletus: An Annaliste reading of Acts 20:15-18a." 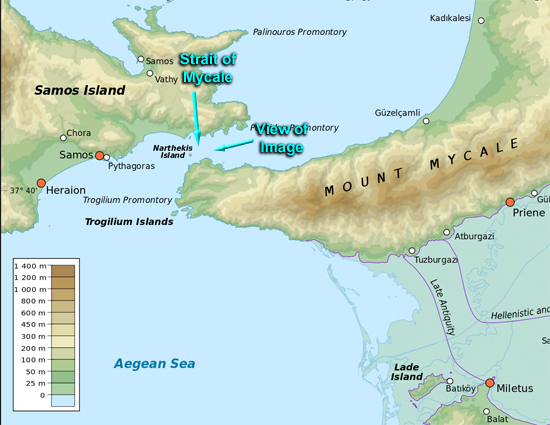 He argues that the vessel that Paul was on sailed through the narrow straight between Samos and Turkey—the "Mycale Strait"— and possibly landed at the chief city of Samos—Pythagoras or at Troglilum closer to the (present) Turkish mainland.